This guest post is from Leah Blinstrub, a registered dietitian and health coach with Blue Cross Blue Shield of Michigan. A believer in the importance of good-tasting food and good nutrition, Leah enjoys cooking, being outdoors with her dog Oscar and spending time with her 1 year-old son and husband. Many people start the New Year resolving to eat healthy, but find by March their determination has dwindled. This March we’re using the National Nutrition Month theme of “Shape Up Your Plate” to breathe new enthusiasm into eating vegetables and eating healthy. We’ve already seen what salty and sweet have to offer; this week we start the journey into the flavor described as bitter. Bitterness is often considered an acquired taste. Unlike sweet, we don’t seek it out as babies. It isn’t the flavor we turn to when we’re feeling low and we don’t use its name as a loving sentiment. Bitterness is in fact the most disliked flavor of the four. So how does this flavor of so little favor become something we enjoy eating? When I think of people who have a deep appreciation for vegetables, the first person that comes to mind is Joan Dye Gussow. Her book “This Organic Life” depicts a beautiful self-sustaining garden along the banks of the Hudson River. Gussow makes vegetables sound delicious and the process of growing and eating them extremely rewarding. I mention her because she of all people exhibits a true passion for vegetables, but notes her first experience with kale was unpleasant. Her exact documentation on the plant read “bitter, blue grey and wasted.” Appetizing, right? After she discovers a great recipe for kale, Gussow changes her mind — but the point is that even the most devout vegetable fan can formulate hasty judgments. So here’s your opportunity to really sophisticate your palate and impress your friends. Use kale to prove how bitterness can actually be delicious, attractive, and trendy when prepared correctly. Kale is a descendent of a wild cabbage plant and shares its heritage with other cruciferous vegetables like broccoli and cauliflower. It comes in several different varieties and it’s in season from the middle of winter through spring. Learn the best time to pick or buy bitter vegetables. Kale, for instance, is actually sweeter if picked after the first frost. Research the best cooking method for bitter vegetables. Some vegetables are best roasted, while others like broccoli rabe, which is considered bitter, are better blanched. To blanch a vegetable, submerge it in boiling water for a short time (about 1 minute) and then immediately plunge it into an ice bath to stop the cooking process. Avoid overcooking. Some vegetables, especially the cruciferous family, become more bitter when overcooked. The cooking process, if allowed to go too long, actually leads to the production of sulfur compounds. These compounds not only emit the lovely aroma of eggs (yuck! ), they also increase bitterness. Combine bitter vegetables with a light vinaigrette dressing. Bitter vegetables pair well with the flavors of garlic, honey, salt, pepper and lemon, so don’t hesitate to vary additions to your vinaigrette. One way to make this bitter tasting vegetable taste great is to give it some love by giving it a massage. It sounds funny I know, but you can actually massage some of the bitterness out of kale. What’s left of the bitter taste is mingled with a delightfully light, sweet and fruity flavor. Trust me, this recipe is fantastic! Try it using the following tips and you’ll appreciate just how wonderful bitter can taste. Wash and dry the kale leaves. Cut the kale leaves away from the stem and toss the stems. Stack the leaves and roll them into the shape of a cigar. Cut into thin ribbons. Put the kale ribbons into a large mixing bowl. Add the salt and lemon juice and massage into kale with your hands for 5 minutes. The volume of the kale should reduce by about one-third. Toast the sunflower seeds in a skillet over low heat and stir constantly for about 2 minutes or until they darken in color and smell flagrant. Remove kale from the bowl, drain and discard the liquid. Dry the bowl and replace the kale. Add the remaining ingredients, mix together and top with the dressing below. Mix honey and lemon juice. Add black pepper and wisk in olive oil. Mix together. 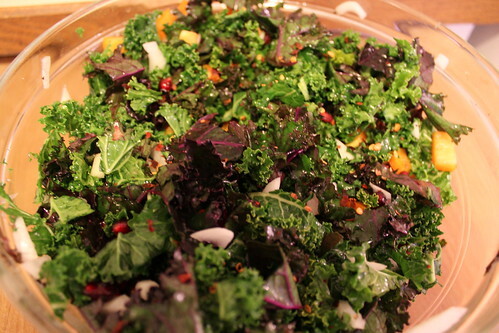 *Depending on the yield or amount of kale left after the massage, doubling the dressing may be necessary. Don’t miss the final blog post of the series next week…sour. This looks quite tasty! I especially liked the video that showed exactly how to make this kale salad. Very helpful…and pretty funny! I grew up eating greens (mustard, collard and turnip) so trying kale wasn’t a stretch. I wish I ate it more often. It’s more readily available now but it wasn’t when I was introduced to the food. I prefer it cooked but we’re now cooking our veggies for much shorter periords so I’m game for eating it raw. The video is funny. I’m really excited though about the book mention. I’m a foodie and a reader. I’m going to look for the book. Thanks.